In addition to the abundance of regional theater readily available throughout the UK, the other bit of brilliance that makes me want to hop on the next Boeing 777 and head east is the very civilized process of continuing to develop of good comedy via BBC Radio 4, which is also home to one of my all-time favorites, Desert Island Discs! Over the years, much of what we have seen on the telly has come by way of first being recorded for radio in front of a live studio audience. 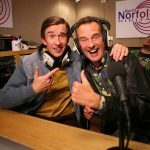 Mega-hit comedies such as Hitchhikers Guide to the Galaxy, Little Britain, League of Gentlemen, Alan Partridge and Miranda all had their early beginnings in radio. 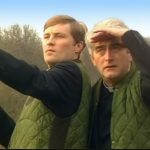 Just around the corner could be the next telly hit as former Father Ted and My Hero star, Ardal O’Hanlon, heads the cast of Best Laid Plans. “In 1885, God nodded off. 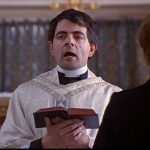 In 2014, he awoke to discover that his idiot servant, the angel Smallbone (played by O’Hanlon), had accidentally handed out God’s plans for the next millennium when he was only meant to hand out plans for the next century. A thousand years of leisurely human progression (we weren’t even meant to have pocket calculators until 2550) has been crammed into the last 129. No wonder we’re all so stressed. In addition to O’Hanlon, Esther Smith (Uncle) will play Tanya. No word yet from the producers as to who will play God. If you happen to find yourself in the vicinity of RADA Studios 16 Chenies Street, London WC1E 7EX next week, I would suggest grabbing a couple of tickets for the BBC Radio 4 taping on Oct 22-23. If you’re not in the immediate area, hop on the Tube and head to the Russell Square station on the Piccadilly line where it’s approximately a 5-10 minute walk to the theater. FYI, if you are a budding comedy writer, Jane Berthoud, head of BBC Radio Comedy, has a bit of advice to comedy writers and producers looking to pitch and win commissions across her slate. Doesn’t sound all that different from writing for TV, to be honest. Good comedy is good comedy. It all starts with ‘the character’. 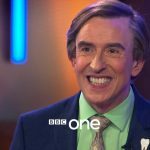 For a perfect example of a comedy character that had its’ beginnings in radio, all you have to do is look in the vicinity of Steve Coogan and the greatness that is Alan Partridge. 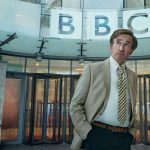 Are you ready for Alan Partridge’s primetime return to the BBC? He is!